Greyhound chic | Will My Dog Hate Me? I admit it. I have a soft spot for greyhounds. My friend Karyn is a tireless advocate for them, and through personal acquaintance with her pups, Painter (see April 25 post) and Lily, I’ve come to appreciate how funny and sweet tempered they are, no matter what curves — especially those on race tracks — life throws them. So here’s another birthday picture, this one of Lily on her 10th. 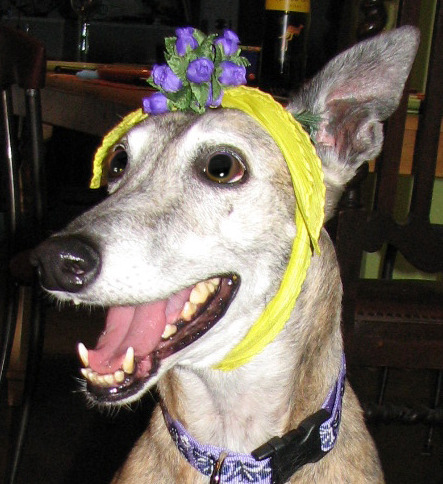 The Italian greyhound in the more elaborate floral hat is also a rescue, though not one with whom I’m personally acquainted. 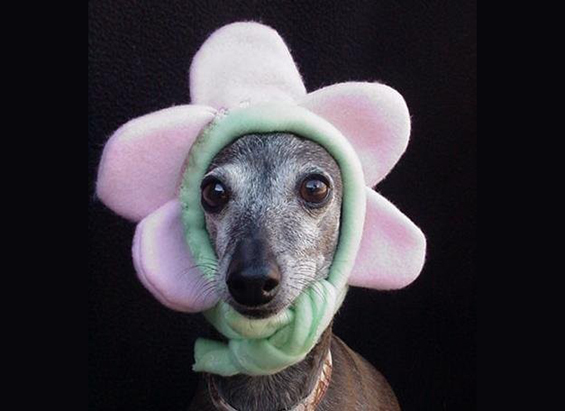 I found the picture on Etsy, a great shopping site devoted to handcrafted items of all kinds, including pet clothing. They even ran a survey on who is more fashionable, cats or dogs. Guess who won? Lots of people think greyhounds are nervous and skittish. I hope these pictures help dispel that notion. A dog’s got to be pretty mellow to wear that headgear. Lily looks like she’s reveling in the attention. I’m for breaking down breed prejudices, so if anyone has pictures of clothed pitbulls, rottweilers, dobermans and other so-called dangerous dogs, please send them to me. The outfits don’t have to be elaborate. A rakish bandana or some tasteful footwear will do. Lilly is such a darling girl. I love her looks of joy 🙂 My greys are very sweet, very tolereant dogs. I have clothes and costumes for mine as well. Right now I’m working on a renn. faire dress for my sweet girl Opal. Thanks, Lizzie. Do send in a picture of Opal in her Renaissance Faire dress — I’d love to see it!